The launch of Rs 100 coin comes weeks after the government introduced Rs 200 denomination note for the first time. 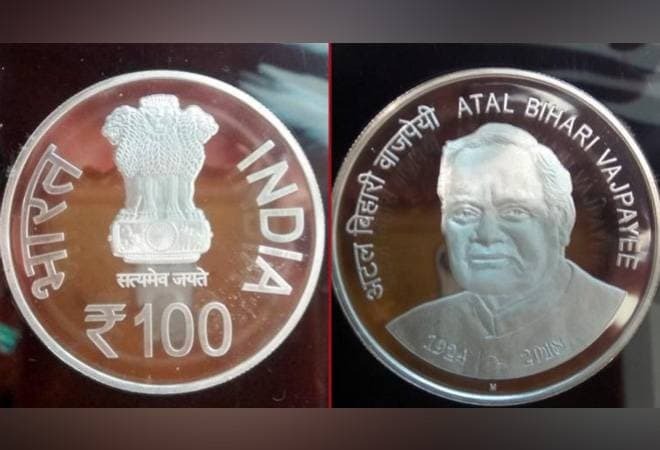 Prime Minister Narendra Modi on Monday released a commemorative Rs 100 coin in memory of former prime minister Atal Bihari Vajpayee. Senior BJP leaders, including Finance Minister Arun Jaitley, BJP Chief Amit Shah, Lok Sabha Speaker Sumitra Mahajan and senior leader Lal Krishna Advani, were also present at the event. This Rs 100 currency will be the highest denomination in the form of a coin. The former prime minister died at the AIIMS in the national capital in August at the age of 93 following prolonged illness. Addressing the gathering, Modi said he would go to Vajpayee's memorial on Tuesday to reiterate his commitment to the ideology and path shown by the statesman. "Atal Ji wanted democracy to be supreme. He built the Jana Sangh. But, when the time came to rescue our democracy he and others went to Janata Party. Likewise, when the choice was between remaining in power or comprising on ideology, he left Janata Party and formed the BJP," the prime minister said. One side of the coin features former PM Atal Bihari Vajpayee, with his name inscribed in it. His dates of birth and death are written at the bottom of the coin. The other side of the coin features the Ashoka Pillor Lion Capital with 'Satyamev Jayate' inscribed at its bottom. This side also has 'India' carved in English while 'Bharat' in Devanagari. The Rs 100 coin, which weighs around 135 grams, is made up of four metals, including silver (50 per cent), copper (40 per cent), zinc (5 per cent), and nickel (5 per cent). Meanwhile, on this occasion, the PM Modi also said while for some, power is oxygen and they cannot live without it, Vajpayee spent a long part of his career in the opposition benches raising issues of national interest. The late prime minister never compromised on the ideology of the party, Modi said. He said, the party, which "Atalji built brick by brick" has become among the largest political parties. Prime Minister Modi said Vajpayee as a speaker was unparalleled. "When he spoke, the nation spoke... when he spoke the nation listened," he said. Earlier this year, it was reported that the government may also introduce Rs 1000 coin, however, the government has not made any announcement on that. The Opposition parties had even asked the Finance Minister in the Rajya Sabha to clarify whether they had any plan to introduce Rs 1,000 coin. Ever since demonetisation in 2016, the government has introduced several changes in existing currencies and issued three new denomination -- Rs 200 and Rs 2,000 notes. The new currency note of Rs 2,000 value was issued immediately after the note ban and Rs 200 currency note was introduced earlier this year. Apart from this, the government also issued the currency notes of Rs 50 and Rs 500.